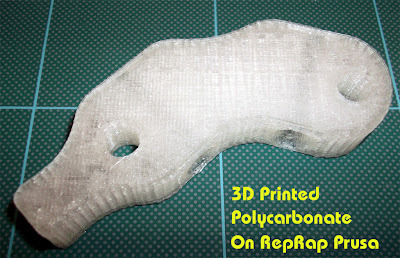 A little while back I posted on the Reprap Forum about printing with Polycarbonate, no one seemed to have done this yet so I had some pure Polycarbonate filament made up and some other mixes to enable some further experimentation and testing, here are my initial results and findings with Pure Polycarbonate. Firstly if you are not exactly sure why Polycarbonate is worth investigating for 3D printing, take a look at the Wikipedia page, basically it's strong and impact resistant (It's used in the making of bullet proof glass) temperature resistant and luckily it is a thermoplastic so can be extruded (at the right temperature). 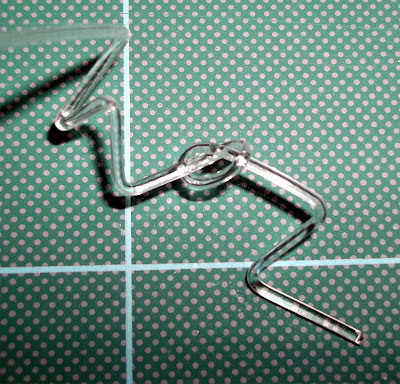 It can be bent and formed while cold without cracking or deform and it is also very 'crystal' clear, but that's actually not so important for us as will become apparent below. Don't confuse Polycarbonate with Acrylic or Plexi-glass, they shatter and crack, Polycarbonate tends to just bend and deform and after much effort will eventually stretch like very hard rubber until it eventually breaks. 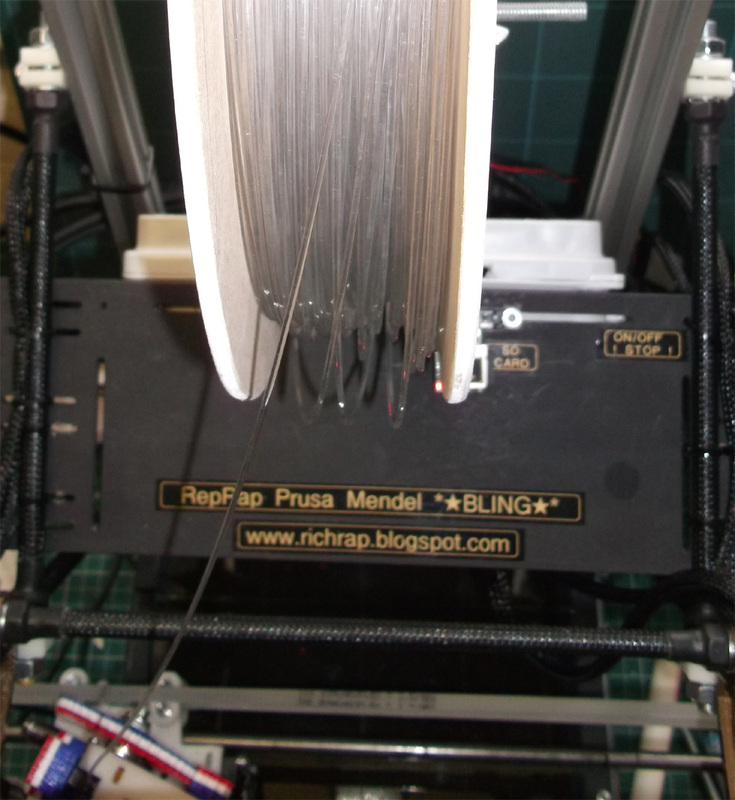 It's a really amazing material, the 'diamond' of plastic, I was excited to test it out. I have used sheet Polycarbonate for all sorts of things so I already had an idea of what to expect when thinking about extrusion. 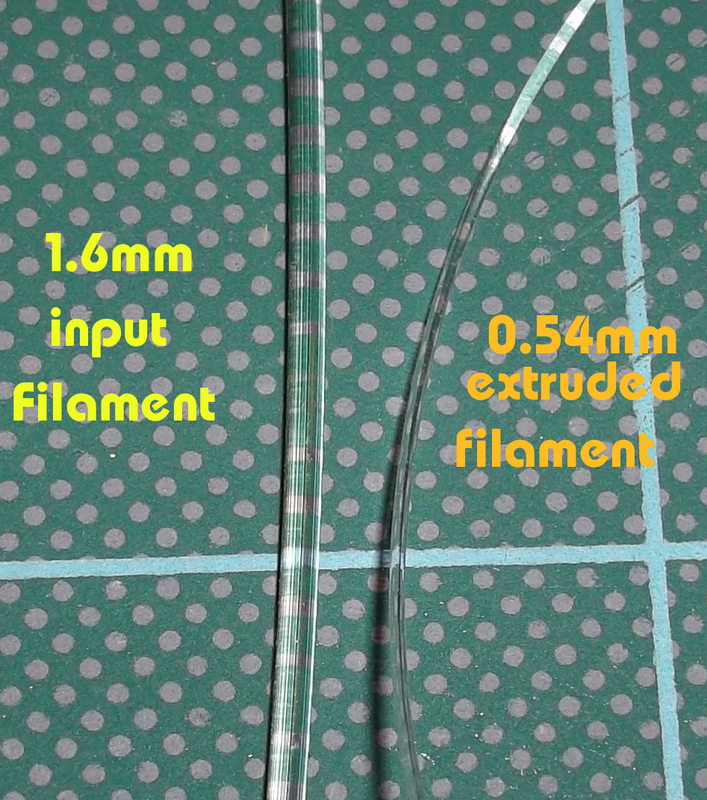 My test Polycarbonate Coil was manufactured at 1.6mm which will work in a 1.75mm extruder. After changing my extruder Esteps and calibrating infill for 0.3mm layer height I started testing. My first test was with the good old Pyramid model. Looking back I should have started with cubes or something requiring less extruder reversals, but it was a good test. I was getting a small amount filament buckle in the cool-end, not a big issue, but extruder reversal needed tweaking a little. 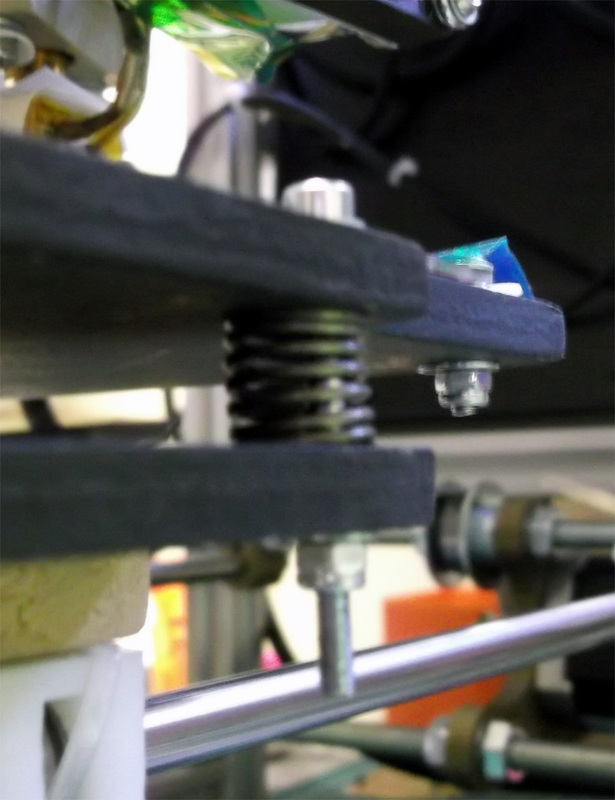 Firstly I started at a reasonable speed of 30mm/sec print and 180mm/sec Travel. I was expecting warp and the extruder to jam, it didn't and printed ok. I then printed again and lowered the temperature until it jammed up. This was a really interesting failure mode ! It didn't do what I was expecting. Normally when you lower the temperature to work a lower limit eventually the hobbed bolt grinds through the filament and carves a chunk out of a single point and the teeth get all jammed up. With the Polycarbonate it kept on driving the filament into a tightly packed block under the Hobbed bolt all around the spare space under the drive just before the opening, as the filament was still being driven I didn't even realise it until I started to see it bulge from under the hobbed bolt. I didn't take a photo of it jammed up in the extruder, but here is it after extraction from the extruder, it's been stretched a little by me pulling it out, but you can see the failure mode really well. And remember this filament is completely cold (room temperature) when it's doing this, amazing stuff! 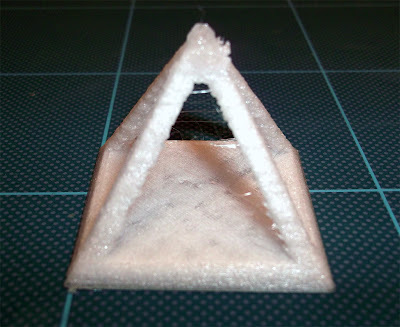 I was reasonably surprised by printed Pyramid looking so 'snow-white' I had initially expected it to look clear, so I experimented with Speed and temperature for the next six Pyramids. What I discovered was that the slower you print and the lower the temperature the 'whiter' the printed object. Also lots of reversal moves gives the object a snow-white appearance. Strength does not seem to be affected by the appearance or speed of printing or indeed temperature. If you print hotter and faster the more clear the object becomes. 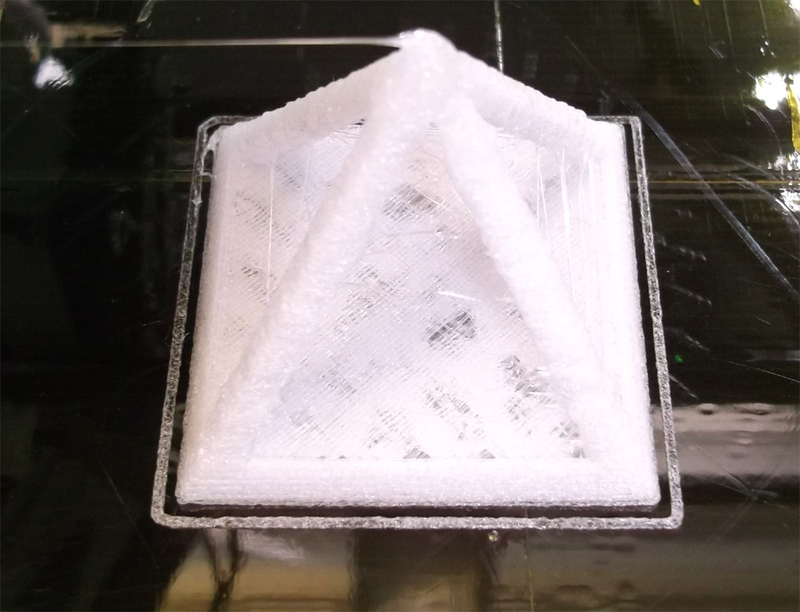 This Pyramid above was printed at 120mm/Sec and 305 degrees C, I don't think it's going to get much more transparent than this due to the many extruder reversals? That's my theory as the free-air extruded filament is clear so something is causing it to change, or maybe other factors like moisture are playing a part? I pulled the hot filament out of the extruder to see what it looked like, you can see the filament is slightly buckled in the drive channel, this is due to the fact it's 1.6mm and my extruder is designed for 1.75mm filament, but not a big problem with this strong material. 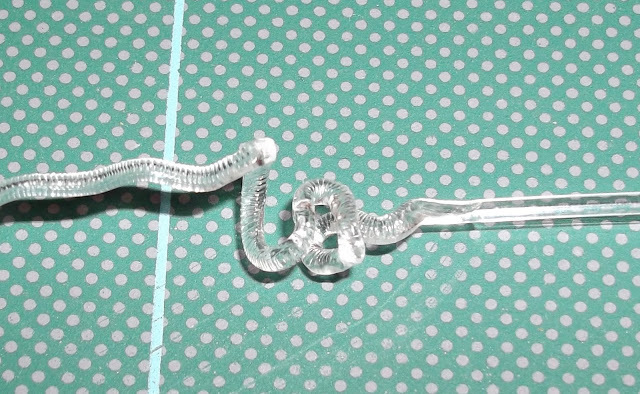 What's really interesting is that the melted part is the same snow-white colour I can see in the printed object. This needs more investigation, maybe I should to try to dry the filament to see if moisture is some of the cause to this? Anyone have any ideas? This should give you an idea of how strong Polycarbonate is, you can bend it when cold and even put a knot in it. As a way to compare PC printing material take a look at the below videos showing PLA and ABS in the same manner. This is part of a wider material testing program I'm doing at the moment. 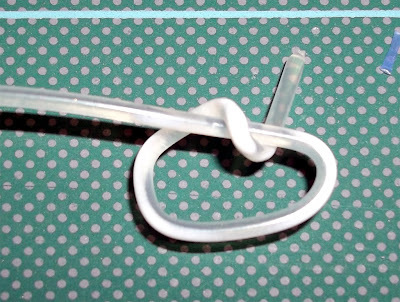 To give you an idea of how difference material handle, take a look at the videos below or on Youtube Here, where I bend twist and break some different filament types and supplies to see how they behave. Future tests will be on a much wider range of suppliers and materials along with printed parts, for an example of how different materials perform after being printed look at the below video where I destroy some printed Pyramids. In the video below I pull and snap apart some printed Pyramids of different material types, they are all made with 20% infill and printed at 80mm/sec with 3 solid layers. Other 3D printing materials - I'm really interested in what other experiences people have had with different material types in 3D printing, please contact me if you want to be involved in materials testing and /or you have any experience of different plastic's. 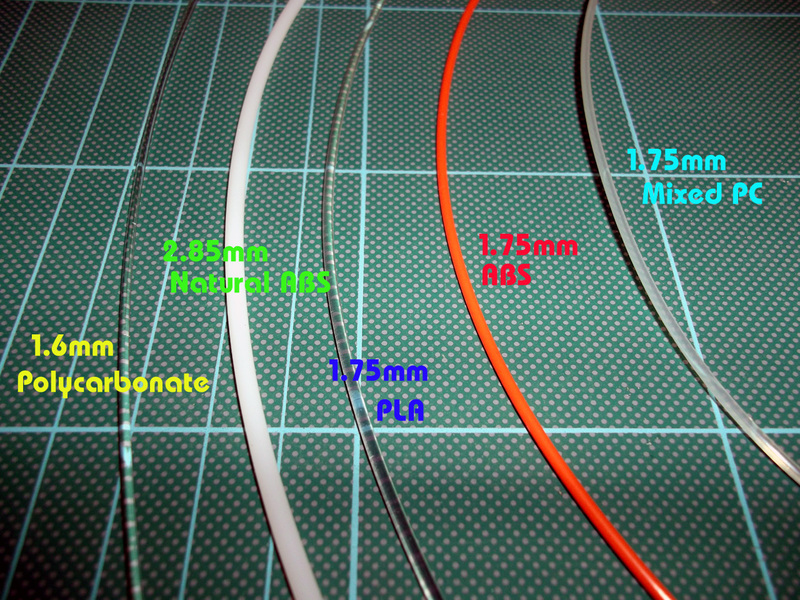 If you also want to test Polycarbonate materials then please do contact me. 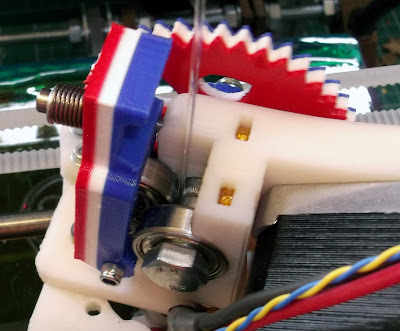 I'm not a plastic's expert or have training on materials analysis but I'm really interested in how different types perform in 3D printing and how blends or mixes of plastic may help enhance our machines and objects. I have some other spools of mixed Polycarbonate materials, the intention was to lower the extrusion temperature and make it even easier and lower cost to use PC on RepRap. I will get around to testing these types when I make another dedicated extruder. 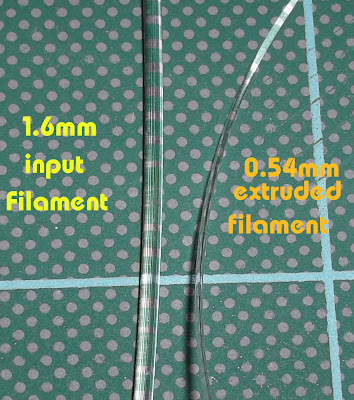 I would really like to add this info to the Reprap.org wiki pages, but I could do with some help on creating pages and sections. At this time references to PC do not exist on the wiki. 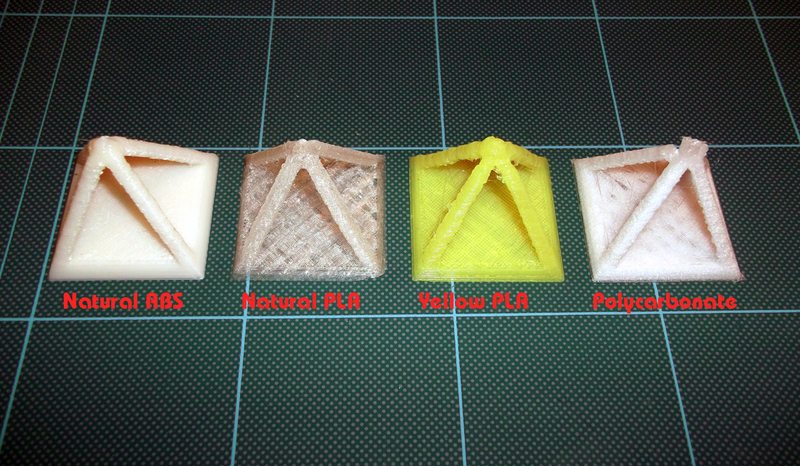 Ideally A page like this for PLA needs to be made for Polycarbonate. 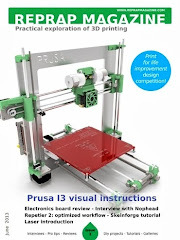 If anyone can help me please get in contact or PM me on the RepRap forum, thanks. Just a quick note and upgrade for you to consider - If you have a Prusa or any other machine with little springs on your build bed / heated bed especially if they are springs from biro pens think about upgrading them. I was getting more and more issues going faster on my Prusa, most of these manifested themselves as less fine outer surfaces and less alignment on the vertical walls. So after fixing all my vertical Z issues (de-couple the Z motor mounts, make sure the rods are really straight, and adding Z rod bearing stabilisers) the only thing remaining was a little wobble on my build-bed. This wobble gets more and more the faster you print / accelerate / stop etc, so I changed my bed springs from the 'official' little ones from biro pens to ones usually used on the Extruder Idler. 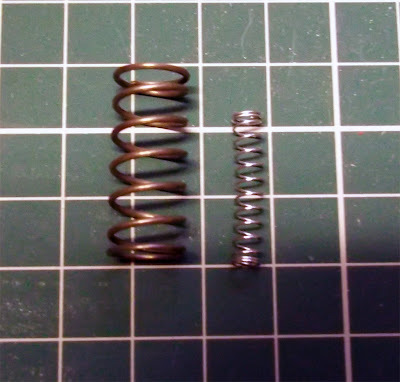 On the left is a ground spring normally used on the extruder. On the right the 'official' bed spring is usually sourced from a disposable biro pen. 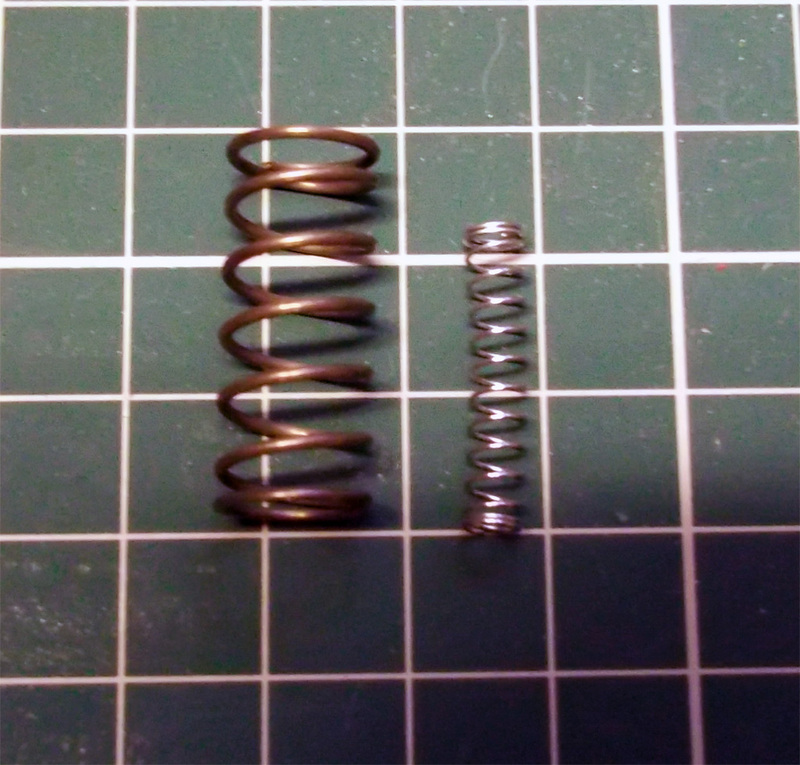 Change to a firm spring, under good compression. 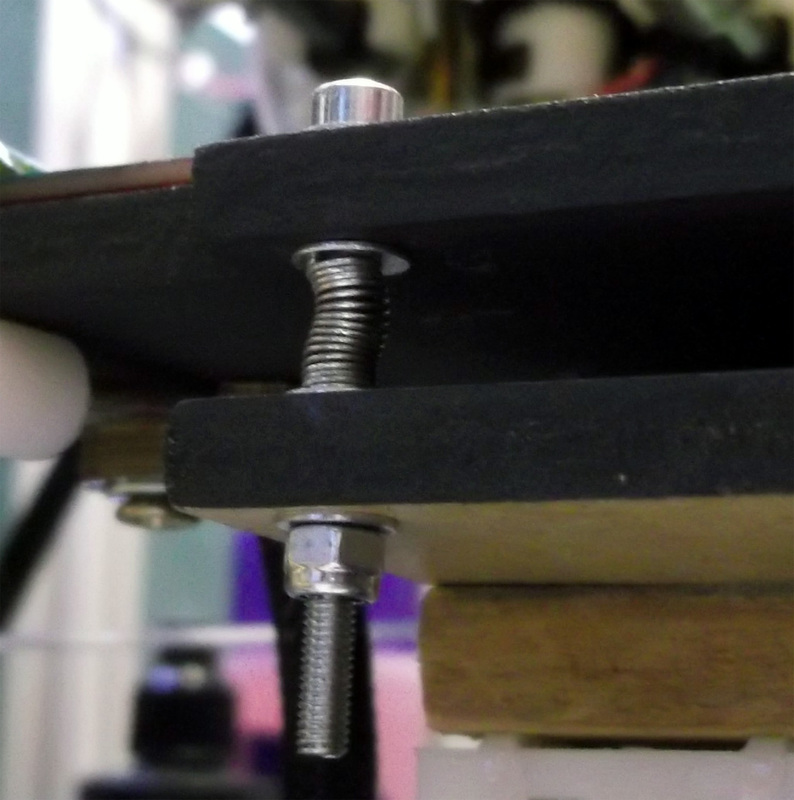 You need a firm spring, and make sure they are well compressed, mind you don't distort the build bed but keep them reasonably tight to stop wobble. Let me know if you change them and if it also improved your print quality.